Rockman Unity says this is an April Fools joke, but I wouldn't be surprise if most of these ended up being real. TruForce's Mega Man X leads by example; what started as a joke manifested into a real product. *shrieking* These jolly well better be real...! Didn't the TruForce Mega Man X figure only become real after fans funded it via Kickstarter? Curious to see if anything comes of this, but considering it's merchandise, wouldn't be surprised if something did. I assume that someone is you? Cause if by real you mean on the market as is right now, than no, it is not real. Yes I know you aren't being literal, I just hate Roll Caskett and will take any opportunity to spoil her fan's fun ;P (not actually though, this is a one time thing). Not gonna lie, that made me laugh. Thank you for that. I'd be sold on a Roll Caskett keychain. A celebration of the best leading blonde lady in gaming. I'm already drooling of excitement!!! Roll themed treats, the cellphone cover of the kotobukiya kit box art, rubberized straps(just in time for when I get a new 3ds xl), and figures!! 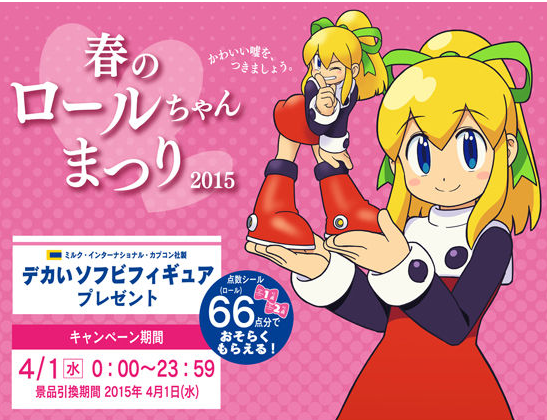 That does it, Roll is in desperate need of her own game. Still, all this sounds grrreat!!! sigh... I hope you're being sarcastic and deliberately exaggerated. That's why I hate April Foolz or whatever the hell, you can never tell. Huh? A celebration ? Interesting. What ? Are you kidding ? April fools day ? Yucky. I do not care about it! By the way, its obviously an April Fools day. April Fools Day is very cruel and mean! Sorry about my English. #4 Ceramic Titanium Straps? If those were real, their material would make their price unrealistically high!